Hello dear friend and fans! This is your very own Steve Sadiq. Hope you are all fine and having a good time. I am writing this article after a small break due to my personal commitments. But I am back now. I am with you guys. The guys who gave me love, respect and consider my articles worthy of reading. I am really grateful to you for your love. Let’s talk about today’s topic. I have decided to share with you guys today regarding How to Print Black and White on Mac. Although technological advancements have gone far ahead yet there are sometimes and place you have to follow traditional practices. And no matter how advanced you are, you will have to follow them. Therefore I have decided to solve your issue by providing you with valuable information about getting the black and white print on Mac. It is good for you that you have a basic understanding of things. This will never let you get stuck with your Mac or another Apple device. We all know that the setting in Mac and windows are not always the same. This is what makes the look and feel something different, something more sophisticated, more reliable. Anyways we are not here to discuss Windows PC VS Mac. We are here to learn about how to print black and while on mac. I am going to share with you the step by step process, you just need to follow the step by step guideline and you will be easily able to get a black and white print on Mac. You must be totally excited. 1.2 If options are missing to print black and white on Mac? 1.3 How to print a PDF in black and white in Mac? If you are using the older versions of Mac, there are quite certain possibilities that you will see an option like, “Mono or Black Cartridge Only”. That is that main reason, I emphasize so much on upgrading your system, no matter you like it or not. A very useful thing about black and white printing is that it reduces the amount of ink used in printing thereby reducing the cost. The 2nd very important thing that you should know about black and white printing is that it simplifies the boosted contrast. Giving you a clear and easy document for reading. Being Apple loyal customers we believe that every new update of Apple will bring something new, something more convenient for us. The quite obvious reason is that the company has stats and well established Research and Development departments. The updates are prepared by looking into the people’s interest. So I was sharing with you guys that in the older versions, you will find the black and white option under color options. This filter is used nowadays by many people and many printers support this feature also. B&W printing also helps to simply boost the contrast of documents. As well as allows you to reduce the amount of ink used by the printers. To print in black and white is quite easy. Task gets cumbersome in printing settings. It all depends on the printer that a Mac device is attached to. 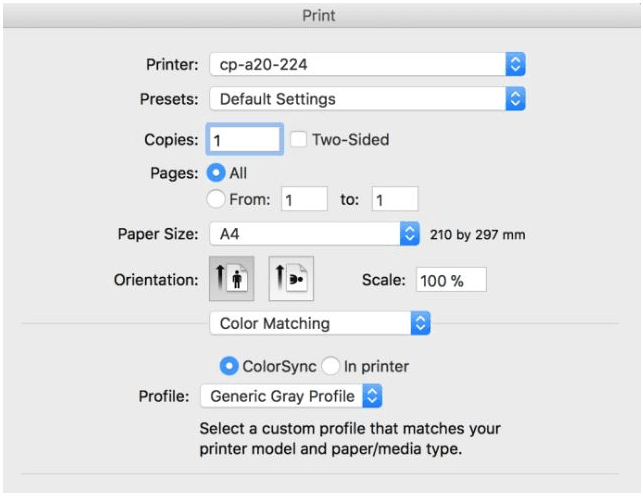 Here, we will cover two ways to print in black and white from a Mac: Some printers make this task very easy as you can print in black and white by directly going on the black and white toggle box, then check it to print in black and white. Now, Choose the printer that you frequently use for black and white prints. Now, click on the show details to know more about the file or your document. 1 printing option, directly check the black and white toggle box and if available click on it. 2 printing option, if no toggle box is available then find the black and grayscale printing options. Now coming downwards select the paper type or quality. After doing this you will see the color option. Select the desired color you want; like white, black or grayscale. Then for sure choose “Black Ink Option” next to grayscale mode option. Lastly, print the document in your desired color (black and white). If options are missing to print black and white on Mac? This will only happen if your printers do not support black and white printing, then you will not see any options to print in black and white. If you know that your printer support black and white or grayscale on a mac but you are not able to find the option to print in black and white or the option is missing then you have to look after these steps. Firstly, you can reset the print system in Mac OS or you can delete or update the printer drivers. 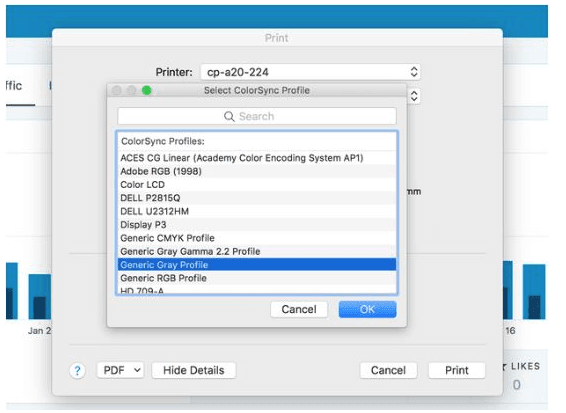 This can be done by the printer options in System Preferences. You can also download new drivers or update drivers for your printer as well, depending on the printer itself, and the printer manufacturer. You can also use a laser printer which only prints in black and white but this is a shortcut way when you mostly print text and can live with the occasional grayscale picture. After doing this all step still, your printer does not support printing black and white then you can’t force your printer to print in black and white. How to print a PDF in black and white in Mac? To print in black and white you might be hard-pressed to find an option to do so in a standard window. OSX helps in this and also supports a number of printers. You can still use a straight OSX feature to print a document in black and white in Mac. To get a printout of your pdf document, first press P key. After doing this choose the color in which you want to print from the Quartz Filter menu. But ensure that “PDF” is used as output format. After doing all these steps you can open the pdf on your screen. Which will display the color which you have selected? This is done with help of QUARTZ filter. This gives the ability to use centralized like plugins. We can apply this on graphic content easily. This feature or filter is applied to content in the preview. When you export it as a pdf, so we can use this to limit colors in an exported document. I fully hope that, you will find today’s article very informative and interesting and now you have got that clear idea of How to Print Black and White on Mac. I have shared very easy and simple step by step guide with you along with the image so that you get the clear understanding of how to print differnt types of files in black and white format on Mac. In this articles, i have shared 2 mehtods with you guys for your ease and comfort. The basic idea was that you people have clear understanding of the concept. The method is divided into 8 steps so that you will follow each step and get the desired result. The 2nd Method is about how to print PDF file format in black and white on mac. I have also share the 6 easy steps of this method. If you carefully follow these steps, you will have nothng to worry. If you still have any questions, you can write to me. I will try to answer your questions. If you like this article, do tell me in the comments section.